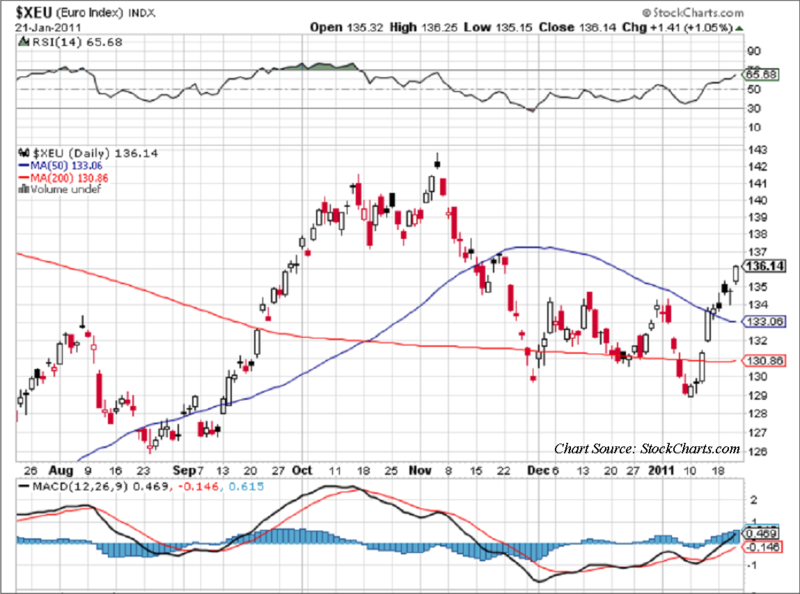 The Euro closed up Friday`s session at 136.13, and looks poised to make a run up to test the 140 level in February. I, among many, was thinking the Euro would next test the 125 level, and things started heading well in that direction with the Euro moving down to 129, and appearing on a downward slope. So what happened? Well, there have been quite a few new developments that prompted this reversal of the euro fortune. First, Portugal and Spain had those long anticipated bond auctions, and they went well with a healthy dose of participation, and at lower than anticipated rates priced into the auctions. In other words, the bond vigilantes bid up expectations for a catastrophic auction, and the buyers stepped in and said thank you very much for these fabulous terms. 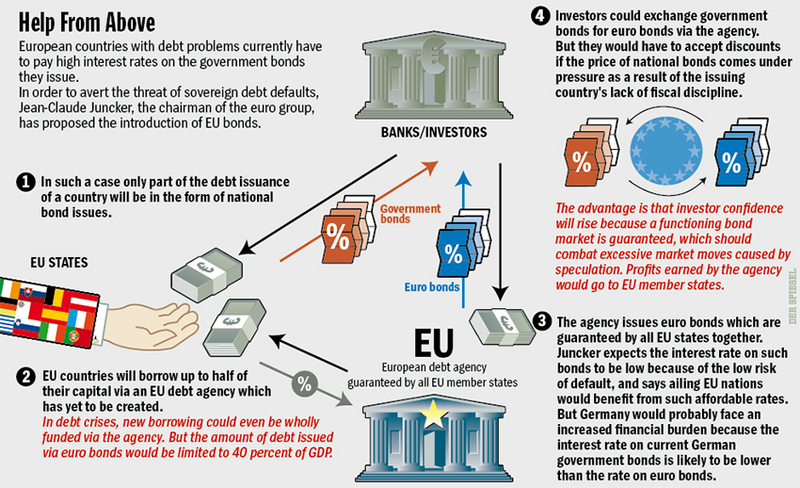 Furthermore, China and Japan had both publicly stated that they would be buyers of these risky European Country Bonds. So any shorts expecting a European collapse because of these much anticipated bond auctions failing miserably had to cover fast when the opposite occurred. The second major turning point was Trichet who made some hawkish comments regarding inflation at his press conference after the ECB`s rate decision. That really caught a bunch of shorts off guard, and sent the Euro up 2 full points in one day. This really illustrated the difference between ECB and the U.S. Fed--ECB`s sole mandate being to ward off inflationary pressures, versus the FED`s dual mandates of monetary policy being governed by unemployment levels and inflation concerns. As such, the Fed will not be able to begin raising the Fed Funds Rate in 2011 as the unemployment rate most likely will not be under 8%, which is the starting point for even considering rate hike according to Bernanke`s remarks on the subject. If you listen to all the language coming out of the Fed minutes, they have always stated that rates are going to be left extraordinarily low for an extended period of time. This type of phrasing has left many analysts with the opinion that the unemployment level would have to get somewhere near the 6.5% levels before Bernanke would even consider raising rates. With a major election coming up in 2012, the focus of the Obama administration and everybody else trying to get re-elected will be lowering the unemployment rate at all costs, even if we have to stomach a little inflation along the way. So, about as hawkish as the Fed will be in 2011 towards inflation concerns is not initiating a QE3 campaign. So it is quite logical that between the two central banks, ECB will most likely be the first to raise rates, and by far the more hawkish when it comes to monetary policy over the next two years. The third major driver behind the resurgence of the Euro is an investment sea change by fund managers at the beginning of the year. In other words, where are the capital flows going in 2011? After emerging markets had stellar returns in 2010 with the likes of Singapore and South Korea, it appears that the fund managers are moving some of their money into Europe with the belief that because of the over-hyped debt concerns of 2010, that European assets are currently undervalued and at a discount to emerging market assets. 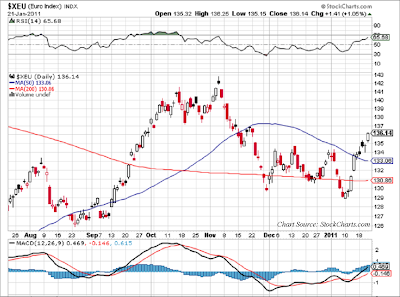 Hot money coming into Europe is extremely bullish for the Euro. The fourth factor affecting investor sentiment regarding the Euro are the strong economic reports coming out of Europe. At the forefront is Germany which is really firing on all cylinders, and looks strong enough to more than offset any budgetary shortfalls of the PIIGS, which actually make up a small percentage of the combined European GDP output. The fifth reason the Euro bulls can point to is last week`s news that the Spanish government is shoring up some of the weakest banks with capital infusions which alleviates some of the concerns regarding Spain`s potential to be the next bond vigilante target. This is the type of proactive governmental response that was lacking in 2010, which was always behind the curve, and only pushed into action by market forces. The fact that European leaders are learning their lesson and trying to get ahead of the bond vigilantes in 2011, which manifests itself in lower financing rates, is very encouraging and bullish for the Euro as well. Finally, there is the news that Germany is finally on board for supporting a unified European Bond, which would provide continuity, stability, and lower financing costs for the union as a whole (See Graph). Financial Times reported that a multi-billion-euro bond was launched in early January to raise money for the Ireland bailout. The triple-A rated bonds are expected to price at yields of about 2.5%, about 70 bps over German Bunds and well below those of Italian and Spanish debt. Asian and Middle Eastern investors could buy about 30% of the paper. ﻿﻿﻿So, it appears that a common eurozone bond will finally occur sometime in the next few months, probably by March of 2011 at the latest, as the final terms are being worked out and negotiated behind the scenes, as well as the financing benefits that this accord will bring to the European Union. More importantly will be the psychological benefits achieved that are supportive of the original concept for creating the European Union in the first place --as a conceptual structure with sound cohesive benefits realized and shared by all members of the common currency. This notion was seriously questioned by many pundits and analysts alike during the height of the 2010 debt crisis. Many believe the entire notion of the European Union was flawed because they could never act as a cohesive body, and implement structural reform measures to address individual weaker member countries financing needs. This euro bond solution appears to be meeting this criticism head on, and will go a long way in reinstating the Euro as the second reserve currency. This bullish is very bullish for the Euro, and will ultimately push it well beyond the 140 level once this confidence in the Euro is solidified and sustained for a period of time. If the Euro is going to get stronger...guess what?...the Dollar is going to get weaker. So you can expect more investors and hedgers to pile into the Euro. And this fact should further reinforce the idea originated in 2007 that the Euro was a strong second reserve currency to the Dollar, and even had many in the middle east clamoring for transactions to be conducted in Euro as opposed to the depreciating US Dollar. From Parity To 160 in Six Months? Expect these same sentiments to reappear as the Euro gains strength against the US Dollar over the next two years. Moreover, as the US starts to address some of its own debt issues, which the European Union finally faced up to in 2010, the 160 level is not that far fetched. It is amazing how financial perspectives can change in as little as six months in the investment marketplace. Nonetheless, here are some ETF ideas for individual investors to go with the new euro trend - WisdomTree Dreyfus Euro (EU), CurrencyShares Euro Trust (FXE), Market Vectors Double Long Euro ETN (URR), Ultra Euro ProShares (ULE).